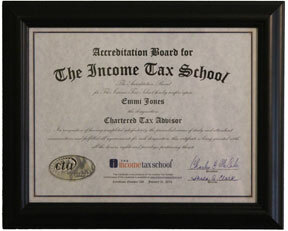 Greenville Technical College, in conjunction with The Income Tax School, is proud to offer comprehensive online tax courses that meet the needs of those just entering the tax profession, as well as continuing education for experienced tax professionals. Learn how to prepare tax with our online tax preparation courses offered by Greenville Technical College and The Income Tax School from the comfort of your home or office at your own pace. The online self-study programs also provide email instructor support assistance to answer questions about the course materials, just like in a traditional classroom. For those looking to become a tax preparer, our tax school programs can help you begin a rewarding tax career quicker than ever. Tax Preparer continuing education courses offered by Greenville Technical College and The Income Tax School provide the perfect opportunity to meet the growing demand for qualified tax professionals. If you want to take your tax career to the next level, browse our tax course catalog for the online course that best suit your qualifying or continuing education needs or grow and build your tax business. Greenville Tech is committed to providing the best training for corporate, professional and personal career development. Over 400 companies and 22,000 students each year have recognized our Corporate and Career Development division as an innovative learning organization. The Corporate & Career Development Division of Greenville Technical College allows you to pursue your career goals at a time, and place, that’s convenient for your busy schedule thanks to our online learning opportunities. Our flexible modes of online learning allow you to attend college even while working, raising a family or doing both. You can learn at your own pace, start and stop as your schedule dictates, and repeat any course materials that you may need to. Choose the program that fits your needs and let Greenville Technical College and our partner providers help you get the education you deserve in a way that fits your busy life.